Monkeys are tree-dwelling (arboreal) mammals. They are in the primate order. Monkeys are intelligent, social animals. Most monkeys have a tail, even if it is a short one. The word "monkey" is not a scientific term. It is used for two rather different groups of primates. The big distinction is between Old World monkeys and New World monkeys. Some monkeys live almost entirely in trees. Others live partly on the ground. Monkeys are mainly vegetarian, with a strong preference for fruit. However, they may eat a wide range of other food, including insects. Monkeys can live in forests and savannahs. Monkeys do not live in deserts. Some can live in snowy mountains, but more live in rainforests. There are none in the rainforests of Australia and New Guinea, and apparently they never reached those islands. In religion and popular culture, monkeys are a symbol of playfulness, mischief and fun. A number of countries have used monkeys as part of their space exploration programmes, including the United States and France. 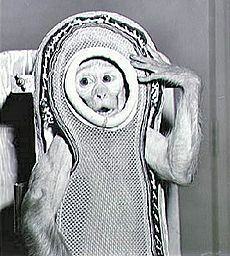 The first monkey in space was Albert II, who flew in the US-launched V-2 rocket on June 14, 1949. Sun Wukong (the "Monkey King"), a character who figures prominently in Chinese mythology, is the protagonist in the classic comic Chinese novel Journey to the West. Monkeys are prevalent in numerous books, television programs, and movies. The television series Monkey and the literary characters Monsieur Eek and Curious George are all examples. 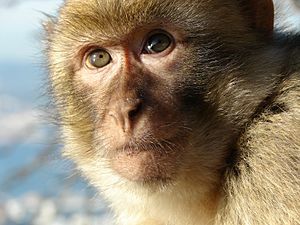 Informally, the term "monkey" is often used more broadly than in scientific use and may be used to refer to apes, particularly chimpanzees, gibbons, and gorillas. Author Terry Pratchett alludes to this difference in usage in his Discworld novels, in which the Librarian of the Unseen University is an orangutan who gets very violent if referred to as a monkey. 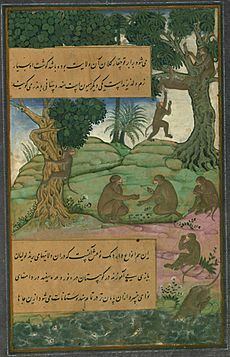 Another example is the use of Simians in Chinese poetry. The winged monkeys are prominent characters in The Wizard of Oz. 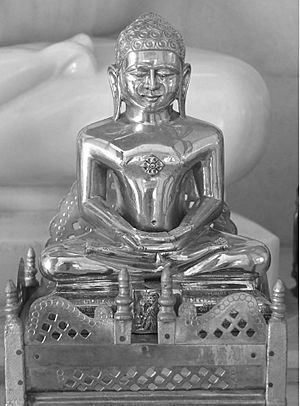 Monkey is the symbol of fourth Tirthankara in Jainism, Abhinandananatha. Hanuman, a prominent deity in Hinduism, is a human-like monkey god who is believed to bestow courage, strength and longevity to the person who thinks about him or Rama. 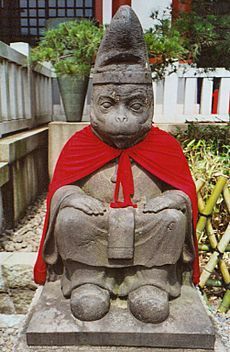 In Buddhism, the monkey is an early incarnation of Buddha but may also represent trickery and ugliness. The Chinese Buddhist "mind monkey" metaphor refers to the unsettled, restless state of human mind. Monkey is also one of the Three Senseless Creatures, symbolizing greed, with the tiger representing anger and the deer lovesickness. The Sanzaru, or three wise monkeys, are revered in Japanese folklore; together they embody the proverbial principle to "see no evil, hear no evil, speak no evil". The Moche people of ancient Peru worshipped nature. They placed emphasis on animals and often depicted monkeys in their art. Monkey Facts for Kids. Kiddle Encyclopedia.